The best way to learn more about we believe is to join one of our Bible Information Classes, where we explore the basic teachings of the Bible. A good place to begin your journey, however, would be to take a closer look at the individual words that make up the name of our congregation: St. Matthew’s Evangelical Lutheran Church. Matthew is the author of the first book of the New Testament, and our church bears his name because we are a Biblical church. We believe that every word of the Bible is God’s Word, and as such it is completely trustworthy and true. The word “evangelical” is a form of the Greek word for gospel, which means “good news.” The good news we treasure is that Jesus is our Savior from sin. And we proclaim that good news in everything we do because it is the only message God uses to create and strengthen faith in human hearts. Most churches call themselves Christian, but what does that mean at St. Matthew’s? It means that no amount of human effort can possibly earn God’s favor or lead to eternal life. It was God’s love and God’s love alone that caused him to send his Son Jesus to live and die for us. God offers forgiveness and salvation to the whole world as a free gift. Everyone who puts their trust in Jesus Christ as their Savior will be saved. St. Matthew’s is proud to be called a Lutheran church, not because we worship Martin Luther, but because of the saving truths Luther reclaimed for the church at the time of the Reformation. These foundational truths of our faith are often summarized with three Latin expressions: sola gratia, sola fide, sola scriptura. Lutherans believe that our salvation is by grace alone, through faith alone, on the basis of Scripture alone. 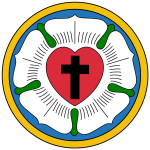 The teachings Lutherans confess on the basis of God’s Word are summarized in the Book of Concord of 1580. This collection of nine documents includes statements of faith that unite us with all Christians and statements that summarize what Lutherans specifically believe. Finally, St. Matthew’s belongs to a larger church body known as WELS, the third largest Lutheran church body in America. For more information about the WELS, click here. If you would like to talk with someone, or you have additional questions, please contact us.